Holy macaroni are these easy to make! I haven’t seen a recipe this easy since the macaroons. The problem with the feta and artichoke appetizer tart is the same problem as the macaroons: you’re tempted to eat the whole batch. 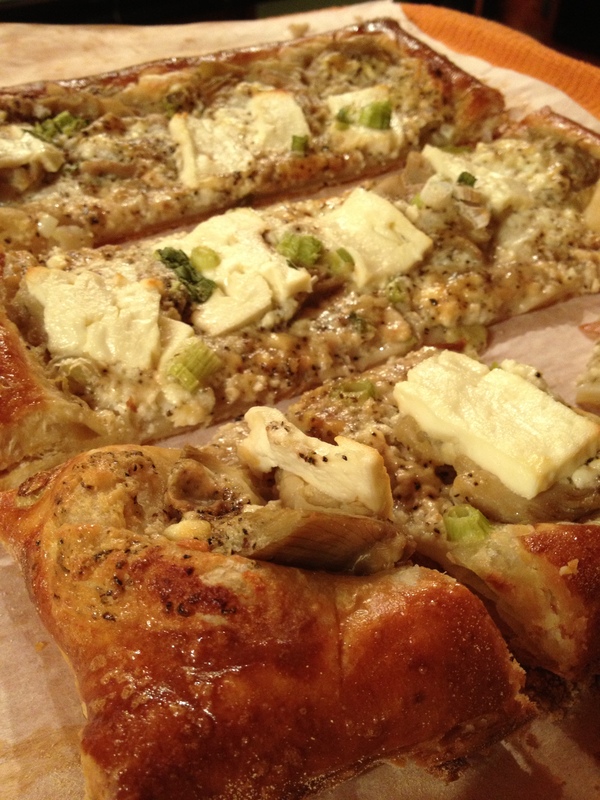 When you bite down on the warm buttery flaky crust of the puff pastry and it mixes with the richness of the feta and tartiness of the marinated artichoke, you reach nirvana. So, here it is: Take a sheet of puff pastry from the 17.3z box (there are 2 in the box) and lay it out on a parchment lined baking sheet. Lightly score the sheet with a knife. Make a “feta mixture” by food processing 1/3c heavy cream with 2z feta and s&p. Spread the feta mixture over the pastry staying 1 inch away from the edge. Arrange artichoke hearts over feta mixture and crumble 2 more oz. feta on top along with thinly sliced scallions. Drizzle with olive oil and brush 1 inch border with 1 beaten egg. Bake at 425 for 10 minutes. Lower temp to 375 and bake an additional 20-25 minutes until you get a beautiful brown color on the edge. Serve warm or at room temperature. This is Steve R Morse in Fort Lauderdale and Northern California with appetizers for tonight. This sounds great and I can’t wait to try it! !